Garden container shape selections are a prime opportunity to define style, create a mood, or reinforce the overall design of your garden. Assess everything from the plant shape to garden context to suggest the finest selection for your garden container. 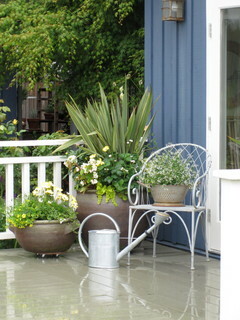 Container gardening is always done within an overall context. Being aware of the context of your garden containers is an important step in achieving a great garden design. 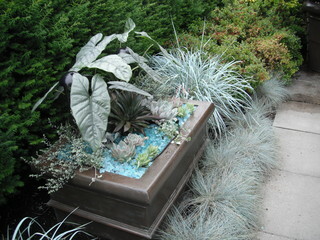 their gardens by directing the influence of their garden container choices. Size, style, color, and material of containers all help to transform our garden containers into works of art. Container shape is among the most subtle of these influences, and has a dramatic effect upon the final composition of a garden space. Take cues from the natural shape of the plants you will be using in your containers. Taller plants are likely to benefit from taller containers, domed plants will often benefit from containers that have straighter sides, whether squared or rounded, thus grounding the dome shape of your planting in a way that is pleasing to the eye. Long low containers make wonderful homes for succulents or other dainty plantings that need room to grow. Trailing plants often benefit from squared off garden containers, as this sets off the delicate tracery of their arching stems. Look for a balance between the shape of your plant(s) and the garden container shape that you choose and magnify the drama of your containers. Reinforce primary shapes by matching or contrasting with them to help bring unity to your completed garden design. Features such as the shape or the expressive lines of garden walkways, patios or stairways can provide context, as can the commanding forms of specimen plants in the garden or the strong profiles of repeated architectural elements such as columns or clipped hedges. Below the designer has reinforced the vertical element of the columns supporting a deck cover by adding vertical elements to the container design for a very effective and striking experience. By associating your garden containers with the contextual elements, you are increasing the impact of both the container and it's primary context, resulting in spectacular compositions. 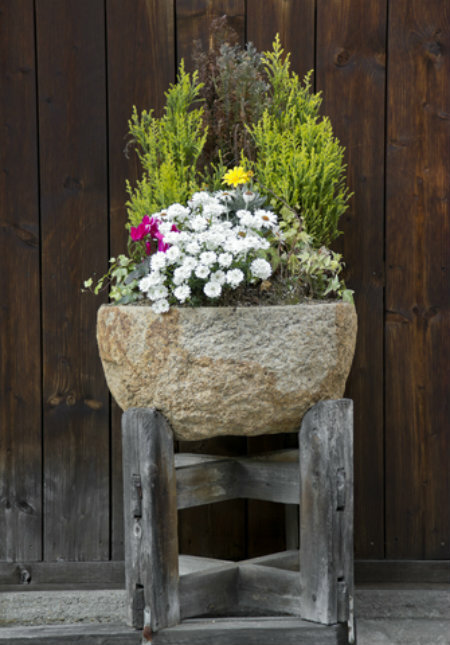 Include an unusually shaped garden container; departures from the unexpected, like a resin cast burlap sack, an old chair, or a cone shaped pot set on its narrow end capture attention. 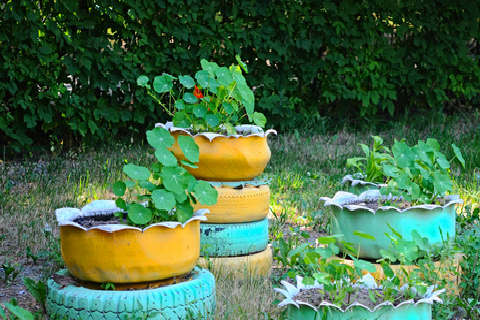 Here, old rubber tires painted in electrifying aqua and yellow colors, and cut metal garden containers painted to match create a powerful statement in an otherwise unremarkable corner of the garden. These variations from the more usual container choices add personality and help to create mood. Pair simple containers with dramatic specimen plantings or unusually shaped plants, thus allowing the plants to take the stage. In this example we see a single caladium planted in a rather long container for its size. However, the use of a simple rectangular shape and unassuming brown container allow the opportunity to visually bridge the container and associate the blue fescue grass plantings that surround the container for dramatic effect. 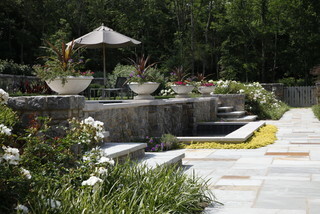 A true coup d'état of design, relying entirely on dramatic plantings to create a masterful effect. Combine two or three simple shapes for maximum impact. Allow garden container shape to contrast or blend with other container shapes to create a quiet mood or a sense of energy. Simplicity with variety is a recipe for design success. Repeat garden container shapes throughout the garden to promote unity. Here, simple white garden containers are arranged along the top of a garden wall and draw the eye to the rear of the garden, thus associating two spaces that would otherwise be perceived as separate areas. 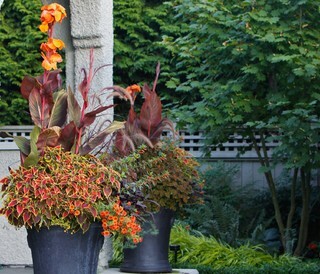 Containers are important tools for drawing the eye through the garden, and wisely employing the shape, color and materials of your containers will effectively connect widely separate spaces. by Nashville General Contractors Natchez Stone Company, LLC. Playing with shapes in the garden is one of my favorite things about garden containers. Shapes have such a significant impact upon space, giving us as container gardeners a huge edge toward manipulating the eye to associate with feelings, places, or even special moments. 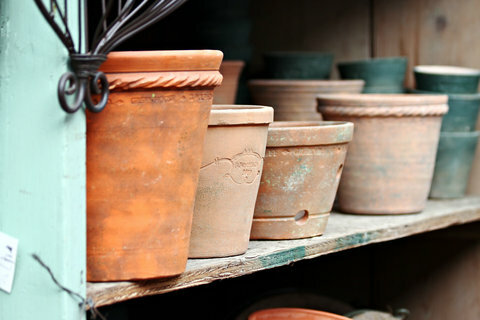 For me, fluted, squared off metal or terra cotta containers automatically associate with elegance, while rustic metal washtubs and aged terra cotta pots send me to my (almost) country roots. Find your most important associations, and turn your garden container shape selections into tools to set your personal style!